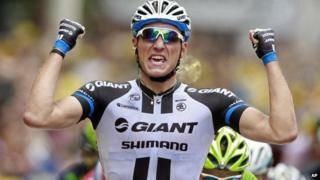 The third stage of the Tour de France has finished in London with a second stage win for German Marcel Kittel. The 96-mile (155km) route from Cambridge to the capital saw tens of thousands of fans lining the roads. It finished on The Mall after taking the 196 riders past Cambridge's historic colleges, through Essex and Epping Forest and on to London. The riders will now leave the UK for stage four which begins at Le Touquet-Paris-Plage in France on Tuesday. The first stage of the 2,277-mile (3,664km) race began in Leeds on Saturday with the teams descending on Harewood House, where the race was officially started by the Duke and Duchess of Cambridge and Prince Harry. A sprint finish saw Marcel Kittel claim his first victory on the same day that British rider Mark Cavendish crashed, dashing his hopes of Tour glory. Sunday's second stage from York to Sheffield was won by Vincenzo Nibali after 124 miles (201km) of punishing roads and hill climbs. As the third stage set off from Cambridge, the peloton passed famous landmarks including Cambridge University's St John's, Trinity and King's colleges. The riders cycled past London's Tower Bridge, Big Ben and on to Buckingham Palace, opposite the finish line. Spectator Ryan Whalesby said: "It was exciting, it started to rain a little bit which obviously puts a bit of a damper on it and they're gone in a shot when they ride past but it's a good feeling. American Theresa Morris travelled to England especially to see the cyclists in the capital. "This could be the only time I see the Tour so I knew I couldn't miss it," she said. "The crowds are great. You have to be in London today." British rider Mark Cavendish crashed out of the race near the finish line of Saturday's first stage and injured his shoulder, ending his Tour. Fans in Essex put up get well messages along the third stage route, which were shared on social media. Cavendish's wife Peta tweeted: "...Thank you. I showed him and he even managed a smile." There will be 18 more stages before the race reaches its final destination of Paris on 27 July.